TLJ Daily E-Mail Alert No. 1,244, November 1, 2005. November 1, 2005, 8:00 AM ET, Alert No. 1,244. 10/31. President Bush announced his intent to nominate Judge Sam Alito to be an Associate Justice of the Supreme Court. Bush stated at a White House event that "He has a deep understanding of the proper role of judges in our society. He understands that judges are to interpret the laws, not to impose their preferences or priorities on the people.". See, transcript. His experience is different from that of Harriet Miers, Bush's previous nominee, who last week withdrew from further consideration. Alito (at right) went to posh schools, worked in many capacities for the federal government, and since 1990, has been a Judge of the U.S. Court of Appeals for the 3rd Circuit. Praise for Alito. Attorney General Alberto Gonzales stated in a release that "Judge Alito is one of our Nation's most distinguished judges, and in his nearly 30 years of public service -- nearly half of that at the Department of Justice -- he has earned a reputation for excellence that few can equal. He served with distinction in the Department's Office of the Solicitor General and the Office of Legal Counsel, and he was recognized as one of the best in his profession as a United States Attorney." Rep. James Sensenbrenner (R-WI), the Chairman of the House Judiciary Committee, stated in a release that Judge Alito is "an outstanding and accomplished jurist". He continued that "Judge Alito has earned widespread respect for his judicial intellect and for his respect and dedication to the law. Prior to his fifteen years of distinguished service on the Third Circuit Court of Appeals, Judge Alito served in numerous high-level positions at the Justice Department, including arguing a dozen cases before the Supreme Court. Judge Alito's qualifications and characteristics led to his unanimous confirmation vote by the Senate to the Third Circuit Court of Appeals, where he has been recognized as a fair-minded and top-notch judicial scholar." Criticism of Alito. Sen. Harry Reid (D-NV) (at left), the Senate Minority Leader, stated in a release that "I am disappointed in this choice for several reasons. First, unlike previous nominations, this one was not the product of consultation with Senate Democrats. ... Second, this appointment ignores the value of diverse backgrounds and perspectives on the Supreme Court. ... President Bush would leave the Supreme Court looking less like America and more like an old boys club." Sen. Patrick Leahy (D-VT), the ranking Democrat on the Senate Judiciary Committee, criticized President Bush in the Senate. He said that "This is a needlessly provocative nomination." "Just last week, the President succumbed to partisan pressure from the extreme right wing of the Republican Party to withdraw his nomination of Harriet Miers. The President abdicated his own role in the Constitution’s process of selecting Supreme Court Justices, and allowed his own choice to be vetoed by extremists within his party", said Sen. Leahy. "It is a pity that the President felt his position was so weak that he had to bend to a narrow but strident faction of his political base." Sen. Leahy also asserted, "I have not formed a final judgment as to the merits of this nomination, although an initial review of Judge Alito’s record suggests areas of significant concern. Judge Alito’s opinions from the federal bench demonstrate that he would go to great lengths to restrict the authority of Congress to enact protective legislation to protect in the areas of civil rights, consumer protection, and the rights of workers, consumers and women. Judge Alito has also set unreasonably high standards for ordinary Americans who are victims of discrimination to meet before being allowed to proceed with their cases." People for the American Way (PFAW), a Washington DC based interest group that devotes considerable resources to defeating conservative judicial nominees of Republican Presidents, stated in a release that it will "wage a massive national effort to defeat Alito's nomination". PFAW President Ralph Neas stated that "Right-wing leaders vetoed Miers because she failed their ideological litmus test. With Judge Alito, President Bush has obediently picked a nominee who passes that test with flying colors." PFAW also released a report [24 pages in PDF] titled "The Record of Samuel Alito: A Preliminary Review". However, it only addresses his opinions in non-technology related cases, such as those involving abortion, religion, gender, and race. Neither Sen. Reid nor Sen. Leahy (nor President Bush, AG Gonzales or Rep. Sensenbrenner) had anything to say about Judge Alito's record on technology related legal issues. 10/31. President Bush announced his nomination of Judge Sam Alito to be an Associate Justice of the Supreme Court. Since he has been a Judge of the U.S. Court of Appeals for the 3rd Circuit since 1990, he has written hundreds of legal opinions. Some of these pertain to technology related subjects. This article reviews a few of these opinions. This case concerns the construction of wireless communications towers, and the provision of the Communications Act, 47 U.S.C. § 332, that limits the authority of state and local governments to regulate the location, construction, and modification of wireless communications facilities, including cell towers. In this case Judge Alito held that there is no violation of 42 U.S.C. § 1983 when a state violates § 332(c)(7). Judge Alito's opinion in this case may give local governments reason to praise him, and telecommunications carriers and other companies that depend on local permitting or franchising authorities reason to regret his nomination. The Supreme Court later held in its March 22, 2005, opinion [22 pages in PDF] in Rancho Palos Verdes v. Abrams that there is no § 1983 remedy for violation of § 332(c)(7). See, story titled "Supreme Court Holds That Individuals Who Sue Under §332 Cannot Also Recover Damages Under §1983" in TLJ Daily E-Mail Alert No. 1,101, March 23, 2005. However, before then, there was a circuit split. One might attribute Judge Alito's holding to straight statutory construction. He relied on the language of the statutes, and judicial precedent. Yet, the 9th Circuit and the 6th Circuit, reviewing the same statutes and precedent, reached the opposite conclusion. If the Judges in these cases allowed policy considerations to affect their holdings, they did not express it in their opinions. Nor is it apparent what those policy consideration would have be. On the one hand, Judge Alito, hypothetically, could have considered, as many conservatives do, that there is too much frivolous § 1983 litigation, and that it should be limited. However, much of this concern arises in the law enforcement context, not telecommunications. On the other hand, Judge Alito, hypothetically, could have considered that § 1983 actions unduly infringe on state rights generally, or perhaps state authority to regulate telecommunications. U.S. v. Zimmerman (Suppression of Electronic Evidence). 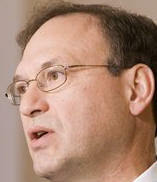 Judge Alito wrote a dissent in U.S. v. Zimmerman, a criminal case in which the Court of Appeals reversed a conviction that was based upon evidence found on a computer. See, January 4, 2002, split opinion. See also, story titled "Third Circuit Holds Evidence Obtained in Computer Search Inadmissable" in TLJ Daily E-Mail Alert No. 340, January 7, 2002. Police searched Zimmerman's computer, pursuant to a warrant. They found child pormography. He was charged with possession of child pormography in violation of 18 U.S.C. § 2252A(a)(5)(B). He moved to suppress this evidence. The District Court denied his motion. The Appeals Court reversed, with Judge Alito dissenting. Basically, the majority held that the police had probable cause to search for evidence of other crimes, but not for the crime at issue in this case. Hence, the evidence must be suppressed under the exclusionary rule. Judge Alito argued that the good faith exception applies. Perhaps it is significant that Judge Alito is a former prosecutor. Perhaps he shares the prosecutors' dislike for exclusion of evidence of crimes. Lepage v. 3M (Antitrust). Judge Alito joined in the Court of Appeal's opinion in Lepage's v. 3M, an antitrust case. This was a 2-1 case in which the dissenter accused the majority of weakening Section 2 of the Sherman Act "to the point of impotence". LePage filed a complaint in U.S. District Court (EDPenn) against 3M alleging violation of antitrust law. It alleged, among other things, that 3M used its monopoly over its Scotch tape brand to gain a competitive advantage in the private label tape portion of the transparent tape market in the U.S. through the use of 3M's multi-tiered bundled rebate structure, which offered higher rebates when customers purchased products in a number of 3M's different product lines. The jury returned a verdict in favor of 3M on unlawful agreements in restraint of trade and exclusive dealing, and against 3M on monopolization and attempted monopolization claims under Section 2 of the Sherman Act. 3M filed motions for judgment as a matter of law (JMOL) and for a new trial. The District Court granted 3M's motion for JMOL on the attempted maintenance of monopoly power claim, but denied 3M's motion JMOL in all other respects, and denied the motion for a new trial. The District Court entered a judgment for trebled damages of $68,486,679. The present appeal followed. The Appeals Court opinion, which Judge Alito joined, but did not write, affirmed the order granting the motion for JMOL of law with respect to the attempted maintenance of monopoly claim, but reversed the order denying the motion for JMOL in all other respects. Hence, the case was remanded to the District Court with instructions to enter judgment in favor of 3M. Judge Dolores Sloviter dissented. She wrote that "the majority applies reasoning that would weaken § 2 of the Sherman Act to the point of impotence. While that may be a consummation greatly to be desired by the behemoths of industry, such as Microsoft or 3M, it would be an incalculable loss to business generally and to the consumer. Section 2, the provision of the antitrust laws designed to curb the excesses of monopolists and near monopolists, is the equivalent in our economic sphere of the guarantees of free and unhampered elections in the political sphere. Just as democracy can thrive only in a free political system unhindered by outside forces, so also can market capitalism survive only if those with market power are kept in check." Southco v. Kanebridge (Copyright). Judge Alito wrote the majority opinion of the en banc panel of the Court of Appeals in Southco v. Kanebridge, a case regarding what is copyrightable subject matter. On December 3, 2004, the Court of Appeals issued its divided en banc opinion [40 pages in PDF]. Judge Alito wrote the majority opinion. The issue was what constitutes sufficient creativity and originality to be protected by copyright. Southco claimed copyright in the serial numbers that it assigns to the parts that it manufacturers. Southco used four part numbers that not only identify the product, but also convey information about the product. Kanebridge copied Southco's numbering system and numbers. This case goes to what rules or mechanical based expression satisfies the originality requirement of the Copyright Act. Ideas, no matter how creative, cannot be protected by copyright. Expression can be protected by copyright. In this case, Judge Alito and the majority of the 3rd Circuit's en banc panel took the position that all of the creativity came in the creation of the rules (an idea) for assigning numbers. The numbers themselves (expression) are entirely dictated by the rules, and hence involve no creativity, or originality. Thus, these numbers are not entitled to protection under copyright law. Judge Roth wrote a dissent arguing that the majority unreasonably pushes all of the creativity and originality to the ideas side of the idea expression dichotomy, and threatens to remove the incentive to create rules based expression. Also, former Judge Michael Chertoff joined in this dissent. He is now Secretary of Homeland Security. "Under Article I, section 8 of the Constitution, Congress has the power ``to secur[e] for limited Times to Authors ... the exclusive Right to their respective Writings.´´ As used in this provision, the terms ``Authors´´ and ``Writings´´ ``presuppose a degree of originality,´´ and therefore ``[o]riginality is a constitutional requirement.´´ Feist Publications, Inc. v. Rural Tel. Serv. Co., 499 U.S. 340, 346 (1991). Accordingly, Congress has provided copyright protection for ``original works of authorship fixed in any tangible medium of expression.´´ 17 U.S.C. § 102(a) (emphasis added). In order to satisfy the ``original works´´ requirement, a work must be original in the sense that it was not copied from another's work and in the sense that it shows creativity (``the creativity requirement´´). Feist, 499 U.S. at 361-363. Although the creativity requirement is not ``stringent,´´ there is ``a narrow category of works in which the creative spark is utterly lacking or so trivial as to be virtually nonexistent.´´"
Then, Judge Alito engaged in a discussion of why, setting statute and precedent aside, under the reasoning of this case, a photograph should be copyrightable subject matter. That is, there is creativity in the invention of camera technology, and in selecting a camera, lens, film, camera settings, lighting, angles, and positions. But, none of these actions are copyrightable expression. The purported expression that the photographer copyrights is the photograph. However, once these creative actions are complete, it the interaction of a machine and the objective reality of nature that results in a pre-ordained object, the picture. Like Southco's product numbers, the photograph is the product of a post creativity mechanical system. Judge Alito wrote that he sees no problem. However, in concluding that photographs should be copyrightable, he injected an additional principle, that photographs are "a work of art", while product numbers are not. He does not offer any black letter law regarding what constitutes art or beauty. Nor does he elaborate on whether courts should make a factual determinations as to whether expressions are "a work of art". The status of photographs is now settled law. And, Southco's product numbers are not significant to most people. Yet, courts are likely to be called upon to answer questions that involve similar analysis as new information technologies are continually developed, and used in new ways. Judge Alito would appear to endorse the principle that courts should impose a strict creativity requirement. Many in the information technology sectors generally support such an approach. Telecommunications carriers and internet services companies have historically supported limiting the scope of copyright. On the other hand, some creators, companies that own creations, and investors in these companies, sometimes support lesser thresholds. Some information products, that are computer aggregated and manipulated, software defined, and mechanically produced, may benefit consumers, but are expensive to produce, yet may not be produced because of the risk that they will not receive copyright protection because the effort and creativity came in establishing the system, not in expressing the work. It is less clear that Judge Alito, or the other Judges of the 3rd Circuit, have developed a unified methodology for determining just when and where there is creativity in the output of rules and machine based systems. See also, story titled "3rd Circuit Opines on Copyright Originality Requirement and Rules Based Expression" in TLJ Daily E-Mail Alert No. 1,042, December 22, 2004. The Supreme Court denied certiorari in this case on October 3, 2005. See, story titled "Supreme Court Lets Stand Holding That Product Numbers Are Not Copyrightable" in TLJ Daily E-Mail Alert No. 1,228, October 6, 2005. Pitt News v. Pappert (Free Speech). Judge Alito wrote the July 29, 2004 opinion [17 pages in PDF] in The Pitt News v. Pappert, a First Amendment challenge brought by a student newspaper to a state statute that restrained certain speech -- paid advertising of alcoholic beverages in university affiliated media. The Court held that statute is unconstitutional, but on narrow grounds specific to this restraint. Some free market advocates have praised Judge Alito for writing this opinion. One group, the Competitive Enterprise Institute, issued a release that singled out just two of his opinions, and Pitt News was one. Judge Alito did find the restraint on free speech to be unconstitutional. Moreover, he did so after concluding that the restraint affected "commercial speech". However, a closer reading of Judge Alito's opinion could also lead one to conclude that his enthusiasm for free speech and a free press is restrained and moderate. For a detailed recitation of the facts of the case, see the Court's opinion, or the summary in the story titled "3rd Circuit Rules in First Amendment Case" in TLJ Daily E-Mail Alert No. 949, July 30, 2004. There are two salient facts in this case. First, the state Pennsylvania's restraint attacked the Pitt News' advertising base; the state did not, for example, impose a prior restraint on publication. Second, the state restraint did not affect all media; it was targeted a just a subset of media. Judge Alito concluded, without discussion, that this case involved "commercial speech". He therefore applied the four prong test created by the Supreme Court in Central Hudson Gas & Elec. Corp. v. Pub. Serv. Comm’n of New York, 447 U.S. 557 (1980). He found the state statute lacking, and therefore held it unconstitutional. But perhaps, his classification warrants some examination. The Pitt News published on current events, politics, social commentary, and other categories of speech that the Courts do no relegate to the less protected status of commercial speech. Also, the Pitt News was dependent upon advertising revenue. Judge Alito separated the content of the publication from its business model. In his opinion, a restraint on the business model is "commercial", and subject to much less scrutiny. But, regulating the business model may preclude publication of the content, which if directly regulated, would be entitled to strict scrutiny. Advertising and news content are part of the same indivisible operation. Judge Alito views them as entirely separable. The point is that limiting a newspaper's ability to derive revenue from one type of speech, can have the effect of limiting, or precluding, it from engaging in other, and more protected, types of speech. In this sense, Judge Alito's opinion is an invitation to government regulators, and those who have influence with government regulators, to attempt to restrict political, social, or religious speech by regulating the revenue source of the publisher of that speech. Second, the state restraint did not affect all media; it was targeted a just a subset. Judge Alito also overturned the state statute because it targeted a narrow segment of the media, as opposed to all media equally. However, while he wrote that "courts must be wary", he at no point articulated any black letter law or principles. He carefully avoided writing anything that might be applied to other situations where some media segments are treated different by government regulators than other media segments. For example, the Communications Act is predicated on the principle that certain communications media (such as radio, television, cable, and satellite) should be subject to regulatory regimes that are not applied to certain other communications media (such as books, magazines, newspapers, pulpits, and lecterns). Moreover, different Federal Communications Commission (FCC) regulated media are treated differently. Broadcast television and cable television are subject to different indecency standards. Sometimes competitors operate under different restraints, solely because one has gone through a recent merger review, and the other has not. One might wonder when do these targeted rules rise to the level of a constitutional issue? Judge Alito informs only that "courts must be wary". 10/31. The Supreme Court denied certiorari in Huckaby v. New York State Division of Tax Appeals, a case involving the state of New York's collection of income tax, on the entire income, of out of state teleworkers who work for a New York company. This is a petition for writ of certiorari to the Court of Appeals of New York, which is the highest court of the state of New York. The state court issued its divided opinion [33 pages in PDF] on March 29, 2005. The petitioner, Thomas Huckaby, is a computer programmer who lives in the state of Tennessee. He worked for the National Organization of Industrial Trade Unions (NOITU), an organization based in Jamaica, New York. Huckaby worked out of a home office in Tennessee, with a computer terminal and data connection, then with a personal computer. He traveled to New York for some purposes. The New York Court wrote that "In 1994, petitioner split his time between NOITU's New York office, where he worked 56 days, and his Tennessee home office, where he worked 187 days." The New York Court added that Huckaby "timely filed 1994 and 1995 nonresident income tax returns with New York. He allocated his income between New York and Tennessee based on the number of days he worked in each state relative to the total number of days he worked in each tax year." But, the New York State Department of Taxation and Finance asserted that he must allocate 100% of his income to the state of New York, and pay New York's income tax on the entirety of his income. The relevant New York statute, Tax Law § 601(e), imposes a tax on "income which is derived from sources in this state of every nonresident". Also, New York's Commissioner of Taxation and Finance wrote a rule that provides a "convenience of the employer test" for taxing income of non-resident workers. It provides that the state can tax out of state work, unless it is done out of state for the "convenience of the employer". The Court wrote that Huckaby worked out of his home for his convenience. The New York court held that "the statute facially evidences the Legislature's intent to tax nonresidents on all New York source income, and to task the Commissioner to develop a workable rule for apportioning and allocating the taxable income of nonresidents who work both within and without the State. The Commissioner has carried out his statutory responsibility by adopting the convenience of the employer test." The New York Court's holding on this issue is a state court's interpretation of state law, and hence, is not reviewable by the U.S. Supreme Court. However, Huckaby also challenged the constitutionality of the New York tax. The New York court held that it violates neither the due process clause, nor the dormant commerce clause. This holding, regarding the U.S. Constitution, is subject to judicial review by the U.S. Supreme Court. But, the Supreme Court declined to take the case. Finally, Huckaby argued before the New York court that the New York tax regime discourages telecommuting. The Court wrote, "Maybe so", but that the legislature, not the court, makes policy. The New York Court split 4-3. The minority would have held for Huckaby, both on statutory construction, and on the grounds that the tax violates the due process clause of the U.S. Constitution. Huckaby has exhausted his appellate remedies. His recourse, and that of other teleworkers, is not to accept employment from companies in the state of New York, or other states that impose predatory taxes on distant information workers. This case also provides a lesson for companies that hire teleworkers, and companies that locate offices in multiple states. If a company locates facilities in the state of New York, it may subject its employees elsewhere to multiple taxes, and multiple tax filings. And this, in turn, puts the company at a competitive disadvantage with companies that do not locate facilities in New York. Huckaby is represented by Peter Faber of the New York office of the law firm of McDermott Will & Emery. The Supreme Court number is 04-1734. See also, Supreme Court docket. 10/31. The aggressive income tax regime that was the subject of the petition to the Supreme Court in Huckaby v. New York State Division of Tax Appeals, has also attracted the attention of some members of Congress, particularly those from the adjacent state of Connecticut. Sen. Chris Dodd (D-CT) and Sen. Joe Lieberman (D-CT) introduced S 2785, the "Telecommuter Tax Fairness Act of 2004", in the 108th Congress. They introduced a related bill, S 1097, the "Telecommuter Tax Fairness Act of 2005", in the present Congress. These bills would add a new section to Title 4 to the U.S. Code. These bills would limit the ability of states to impose state income taxes upon individuals who are not present in their states. There is also a companion bill in the House, HR 2558, sponsored by Rep. Chris Shays (R-CT). Neither Sen. Hillary Clinton (D-NY) nor Sen. Chuck Schumer (D-NY) have cosponsored any of these bills. That is, residents of Connecticut, which is close to New York City, often live in Connecticut, and maintain home offices in Connecticut, but work, via the internet, and other new technologies, for companies based in New York City. They are subjected to income taxes in the state of New York. Yet, they do not send their children to New York schools, rely upon New York fire departments to protect their homes, or otherwise avail themselves of the range of benefits enjoyed by residents of New York. In turn, these are tax revenues that are not going to support Connecticut schools, and fire departments. Sen. Dodd (at left) is not pleased with the current state of affairs. He has also argued that there are other policy benefits of promoting telecommuting. He stated on May 23, 2005, when he introduced the latest version of his bill, that "Telecommuting provides enormous benefits for businesses, families, and communities. It helps businesses lower costs and raise worker productivity. It reduces congestion on our roads and rails, and in so doing it lowers pollution. It helps workers better manage the demands of work and family. And last but not least, it can mean lower income taxes for working men and women." "Yet, the many benefits to workers of telecommuting are today placed in jeopardy because of current law in New York and a few other States. Today, New York State requires that workers pay income tax on income even if it is not earned in the State through their ``convenience of the employer´´ rule. While there are several States that have the ``convenience of the employer'' rule, no other State applies it with the same rigor as New York", said Dodd. See also, story titled "Dodd and Lieberman Introduce Bill to End Double State Taxation of Teleworkers" in TLJ Daily E-Mail Alert No. 976, September 14, 2004. 10/31. The Supreme Court issued an order in FTC v. Schering-Plough Corp., a petition for writ of certiorari to the U.S. Court of Appeals (11thCir) in a case involving antitrust law and the Hatch Waxman Act. The Supreme Court wrote in its October 31, 2005, Order List [16 pages in PDF], at page 2, that "The Solicitor General is invited to file a brief in this case expressing the views of the United States. Justice Breyer took no part in the consideration or decision of this petition." The Federal Trade Commission (FTC) wrote in its petition [PDF] that the issue is "Whether an agreement between a pharmaceutical patent holder and a would-be generic competitor, in which the patent holder makes a substantial payment to the challenger for the purpose of delaying the challenger’s entry into the market, is an unreasonable restraint of trade." The FTC elaborated that "The present case involves a stratagem that a number of pharmaceutical companies have used to frustrate Congress’s resolve to subject drug patents to scrutiny, by entering into agreements that allow them to delay the entry of generic drugs and share the profits derived from maintaining high drug prices. In the two agreements at issue here, the generic manufacturers agreed to delay sale of their products until specified future dates in exchange for cash payments from the patentee. Because the parties anticipated that the patentee’s enhanced profits from delayed generic competition would far exceed the generic competitors’ lost profits, the parties could share a windfall, at the expense of consumers." The Court of Appeals issued its opinion [43 pages in PDF] on March 8, 2005, setting aside the decision of the FTC, and vacating its cease and desist order. The Court of Appeals number is 04-10688. The Supreme Court has not yet decided whether or not to grant certiorari. Although, it has received numerous amicus curiae briefs. See, Supreme Court docket. This case is Sup. Ct. No. 05-273. 10/31. The Supreme Court granted certiorari in Laboratory Corp. of America v. Metabolite Laboratories, a patent infringement case that the Supreme Court might use to revise the law of patentable subject matter. See, Order List [16 pages in PDF] at page 2. Metabolite Laboratories is the holder of U.S. Patent No. 4,940,658, titled "Assay for sulfhydryl amino acids and methods for detecting and distinguishing cobalamin and folic acid deficency". The abstract states: "Method for determining levels of sulfhydryl amino acids, particularly total homocysteine levels in samples of body tissue from warm-blooded animals, methods of detecting cobalamin and folic acid deficiency using an assay for total homocysteine levels, and methods for distinguishing cobalamin from folic acid deficiency using an assay for total homocysteine levels in conjunction with an assay for methylmalonic acid." correlating an elevated level of total homocysteine in said body fluid with a deficiency of cobalamin or folate." Metabolite filed a complaint in U.S. District Court (DColo) against Laboratory Corporation (LabCorp) alleging infringement of its patent. Metabolite prevailed in the District Court. LabCorp appealed. The Court of Appeals (FedCir) issued its opinion [PDF] on June 8, 2004 affirming the District Court. Judge Rader wrote the opinion of the Court in which Judge Friedman joined. Judge Schall dissented in part. The Supreme Court wrote in its Order List that "The petition for a writ of certiorari is granted limited to Question 3 presented by the petition." This is "Whether a method patent setting forth an indefinite, undescribed, and non-enabling step directing a party simply to ``correlat[e]´´ test results can validly claim a monopoly over a basic scientific relationship used in medical treatment such that any doctor necessarily infringes the patent merely by thinking about the relationship after looking at a test result." On August 26, 2005, the Office of the Solicitor General (OSG), at the request of the Court, submitted an amicus curiae brief. It wrote that "The petition for a writ of certiorari should be denied." However, the OSG's objection is that the relevant facts were not well developed in the record. Aside from this, the OSG questioned whether the claim at issue is patentable subject matter. The Supreme Court has released nothing in this case except a few very brief orders. However, one might speculate that some of the Justices may be considering this case as the vehicle for reviewing and clarifying and revising the law regarding the scope of patentable subject matter. The petitioner, LabCorp, is represented by Jonathan Saul Franklin of the Washington DC office of the law firm of Hogan & Hartson. He was, until recently, a partner of the new Chief Justice, John Roberts. The Senate will meet at 9:00 AM. It will resume consideration of S 1932, the deficit reduction omnibus reconciliation bill. 9:00 AM - 5:30 PM. Day two of a two day public workshop hosted by the National Institute of Standards and Technology (NIST) regarding the vulnerability of the NIST approved cryptographic hash algorithm, Secure Hash Algorithm-1 (SHA-1). See, notice in the Federal Register, June 14, 2005, Vol. 70, No. 113, at Pages 34451 - 34452. Location: NIST, Green Auditorium, Building 101, Gaithersburg, MD. 10:00 AM. The House Judiciary Committee's (HJC) Subcommittee on Commercial and Administrative Law will hold an oversight hearing titled "Administrative Law, Process and Procedure Project". The witnesses will be Morton Rosenberg (Congressional Research Service), Christopher Mihm (Government Accountability Office), Jeffrey Lubbers (American University law school), and Jody Freeman (Harvard Law School). The hearing will be webcast by the HJC. Press contact: Jeff Lungren or Terry Shawn at 202 225-2492. Location: Room 2141, Rayburn Building. 10:00 AM - 4:00 PM. The Information Technology Association of America (ITAA) will host a technology demonstration and briefing titled "Interoperable Communications for First Responders". The scheduled speakers are Rep. Dan Lungren (R-CA), Rep. Dave Reichert (R-WA), Bob Gurss (Association of Public-Safety Communications Officials), Bill Stone (Verizon Wireless), William Webb (Congressional Fire Services Institute), and David Aylward (Emergency Interoperability Consortium and Director of COMCARE). For more information, contact Bob Cohen at 703 284-5301 or bcohen at itaa dot org or Charlie Greenwald at 703 284-5303 cgreenwald at itaa dot org. The demonstration will be from 10:00 AM - 4:00 PM in the Rayburn Foyer. The briefing will be in Room 2168A of the Rayburn Building at 12:00 NOON. 1:30 - 4:30 PM. The Department of State's (DOS) Advisory Committee on International Economic Policy (ACIEP) will meet to discuss "U.S. Priorities in the Doha Development Agenda". See, notice in the Federal Register, October 18, 2005, Vol. 70, No. 200, at Page 60597. Location: Room 1205, DOS, 2201 C Street, NW. 2:30 PM. The Senate Judiciary Committee (SJC) may hold a hearing on pending judicial nominations. The SJC frequently cancels of postpones meetings without notice. See, notice. Press contact: Blain Rethmeier (Specter) at 202 224-5225, David Carle (Leahy) at 202 224-4242 or Tracy Schmaler (Leahy) at 202 224-2154. Location: Room 226, Dirksen Building. 4:00 PM. The House Ways and Means Committee's Subcommittee on Social Security will hold a hearing on Social Security Number (SSN) high risk issues. See, notice. For more information, call 202 225-9263. Location: Room B-318, Rayburn Building. 6:00 - 9:15 PM. The DC Bar Association will host a continuing legal education (CLE) seminar titled "Patent Damages: Discovery, Pre-trial and Litigation Strategies". The speakers will be Andrew Aitken (Venable), Charles Fish (AOL Time Warner), and Clifton McCann (Venable). The price to attend ranges from $70-$125. For more information, call 202-626-3488. See, notice. Location: D.C. Bar Conference Center, 1250 H Street NW, B-1 Level. Day two of a five day conference sponsored by the Office of the Secretary of Defense Networks and Information Integration (OSD NII) and the Joint Chiefs of Staff titled "DoD Spectrum Summit 2005". See, notice.For more information, contact Patty dot Hopkins at osd dot mil or 703 607-0613. Location: Radisson Hotel, Annapolis, MD. The House will meet at 10:00 AM for legislative business. The House may take up HR 1606, the "Online Freedom of Speech Act", HR 4061, the "Department of Veterans Affairs Information Technology Management Improvement Act of 2005", and/or HR 4128, the "Private Property Rights Protection Act of 2005". See, Republican Whip notice. 11/2. 12:00 NOON - 1:30 PM. The DC Bar Association's Intellectual Property Law Section will host a panel discussion titled "Intellectual Property Damages From An Economist’s Perspective". The speakers will include Carla Mulhern (Analysis Group), John Jarosz (Analysis Group), and Abram Hoffman (Abram E. Hoffman, LLC). Mike Morin (Finnegan Henderson) will moderate. The price to attend ranges from $15-$30. For more information, call 202 626-3463. See, notice. Location: Finnegan Henderson, 901 New York Ave., NW. 12:00 NOON - 2:00 PM. The DC Bar Association will host a panel discussion titled "Trade with China: What Next?". The speakers will include David Stewart (aide to Rep. Phil English (R-PA)), Haiying Jiang (Embassy of the Peoples Republic of China), Patricia Mears (National Association of Manufacturers), John Greenwald (Wilmer Cutler), and Keith Loken (Department of State). The price to attend ranges from $15-$25. For more information, call 202 626-3463. See, notice. Location: D.C. Bar Conference Center, 1250 H Street NW, B-1 Level. 2:00 PM. The U.S. Department of Agriculture's (USDA) Rural Telephone Bank will meet. See, notice in the Federal Register, October 25, 2005, Vol. 70, No. 205, at Page 61600. Location: USDA, Whitten Building, Conference Room 104-A, 12th & Jefferson Drive, SW.
2:30 PM. The Senate Commerce Committee (SCC) will meet to mark up S 1063, the "IP-Enabled Voice Communications and Public Safety Act of 2005". This bill had previously been scheduled for mark up on October 19 and 20, 2005. See, notice. Press contact: Melanie Alvord (Stevens) 202 224-8456 or Melanie_Alvord at commerce dot senate dot gov, or Andy Davis (Inouye) at 202 224-4546 or Andy_Davis at commerce dot senate dot gov. Location: Room 216, Hart Building. 5:00 PM. The House Rules Committee will meet to adopt a rule for consideration of HR 4128, the "Private Property Rights Protection Act of 2005". Location: Room 312, Capitol Building. 6:00 PM. The House Ways and Means Committee will meet to hold an informal markup of the draft implementing proposal [49 pages in PDF] for HR __, the "United States-Bahrain Free Trade Agreement Implementation Act". Location: Room 1100, Longworth Building. Day three of a five day conference sponsored by the Office of the Secretary of Defense Networks and Information Integration (OSD NII) and the Joint Chiefs of Staff titled "DoD Spectrum Summit 2005". See, notice.For more information, contact Patty dot Hopkins at osd dot mil or 703 607-0613. Location: Radisson Hotel, Annapolis, MD. 9:30 AM. The Senate Judiciary Committee may hold an executive business meeting. The SJC rarely follows the agenda for its business meetings. The SJC frequently cancels of postpones meetings without notice. Press contact: Blain Rethmeier (Specter) at 202 224-5225, David Carle (Leahy) at 202 224-4242 or Tracy Schmaler (Leahy) at 202 224-2154. Location: Room 226, Dirksen Building. 12:00 NOON. The House Homeland Security Committee's (HHSC) Subcommittee on Economic Security, Infrastructure Protection, and Cybersecurity will hold a hearing titled "The Future of TSA’s Registered Traveler Program". Location: Room 311, Cannon Building. 2:00 PM. House Judiciary Committee's (HJC) Subcommittee on Courts, the Internet, and Intellectual Property will hold a hearing titled "Content Protection in the Digital Age: The Broadcast Flag, High-Definition Radio, and the Analog Hole". The hearing will be webcast by the HJC. Press contact: Jeff Lungren or Terry Shawn at 202 225-2492. Location: Room 2141, Rayburn Building. Eolas is the licensee of U.S. Patent No. 5,838,906, titled "Distributed hypermedia method for automatically invoking external application providing interaction and display of embedded objects within a hypermedia document". Eolas has asserted, successfully, that Microsoft's web browser, Microsoft Internet Explorer (MSIE), incorporates the invention disclosed in this patent. On August 11, 2003, a trial jury of the District Court returned its verdict that MSIE infringed this patent. The jury also awarded damages of $521 Million. See, story titled "Jury Returns Verdict of Infringement Against Microsoft in Eolas Browser Patent Case" in TLJ Daily E-Mail Alert No. 716, August 12, 2003. Microsoft appealed. Also, on October 30, 2003, the U.S. Patent and Trademark Office (USPTO) issued a "Director Initiated Order for Reexamination" of this patent. See, story titled "USPTO Orders Reexamination of Eolas Patent" in TLJ Daily E-Mail Alert No. 778, November 13, 2003. This is Control No. 90/006,831. On March 2, 2005, the U.S. Court of Appeals (FedCir) issued its opinion [29 pages in PDF] in, vacating in part, and affirming in part, the judgment of the District Court, and remanding. The Court of Appeals held that the District Court "improperly granted judgment as a matter of law (JMOL) in Eolas' favor on Microsoft's anticipation and obviousness defenses and improperly rejected Microsoft’s inequitable conduct defense, this court vacates the district court's decision and remands for a new trial on these issues." See, story titled "Federal Circuit Vacates in Eolas Patent Case" in TLJ Daily E-Mail Alert No. 1,087, March 3, 2005. Microsoft is represented by Carter Phillips of the Washington DC office of the law firm of Sidley Austin Brown & Wood. Eolas is represented by Martin Lueck of the Minneapolis law firm of Robins Kaplan Miller & Ciresi. The Court of Appeals number is 04-1234. The Supreme Court number is 05-288. See also, Supreme Court docket. See also, Microsoft's Eolas web page. 10/28. The U.S. District Court (NDCal) issued an order [PDF] in Google v. Microsoft that stays Google's action in federal court in the state of California until the completion of Microsoft's action against Google in state court in Washington. On July 19, 2005, Microsoft filed a complaint in Superior Court, King County, Washington, its home court, against Google and Kai-Fu Lee, alleging that Kai-Fu Lee, a former employee, breached his employee confidentiality and non-compete agreement with Microsoft, by going to work for Google on competing projects. On September 13, 2005, the court in Washington issued a Preliminary Injunction [13 pages in PDF] that provides that until trial, Kai-Fu Lee and Google are enjoined from engaging in certain activities. Google and Kai Fu Lee filed a complaint in U.S. District Court (NDCal), Google's home court. The District Court just issued its stay order in this action. This case is Google, Inc. and Kai-Fu Lee v. Microsoft Corporation, U.S. District Court for the Northern District of California, San Jose Division, D.C. No. C-05-03095 RMW, Judge Ronald Whyte presiding. 10/31. The Federal Communications Commission (FCC) published in the Federal Register its Semiannual Regulatory Agenda. See, Federal Register, October 31, 2005, Vol. 70, No. 209, at Pages 65540 - 65601. 10/31. The Federal Trade Commission (FTC) published in the Federal Register is Semiannual Regulatory Agenda. See, Federal Register, October 31, 2005, Vol. 70, No. 209, at Pages 65638 - 65648. 10/31. The Department of Justice (DOJ) published in the Federal Register its Semiannual Regulatory Agenda. See, Federal Register, October 31, 2005, Vol. 70, No. 209, at Pages 64852 - 64893. 10/31. The Department of Commerce (DOC) published in the Federal Register its Semiannual Regulatory Agenda. See, Federal Register, October 31, 2005, Vol. 70, No. 209, at Pages 64394 - 64482.